This page has Cabinet decision highlights about buffalo and cattle policy in the Northern Territory (NT). The national brucellosis and tuberculosis (BTB) eradication campaign in the 1980s was a co-operative effort between producers, state and territory governments and the Commonwealth Government aimed at maintaining Australia’s competitive meat marketing position by pre-empting specific changes in the hygiene requirements of the major meat importing countries and particularly the United Sates of America. The objective was to have Australia free of BTB by 1992. In January 1981, Cabinet had approved an eradication policy for bovine BTB in the Northern Territory. In December 1982, Cabinet was presented with a detailed plan to implement the policy in relation to cattle and domesticated buffalo. This plan aimed for freedom from BTB in the southern part of the Territory by 1990 and in the north by 1992, with a range of measures to assist cattle producers with on-property costs associated with the campaign. There was an estimated 1.6 million to 1.8 million cattle in the Northern Territory at the time, with 174 herds assessed as being free from both diseases, 341 herds infected with tuberculosis and 94 herds with both diseases. Cattle producers were able to participate in the campaign by implementing approved programs of disease eradication. Approximately 1.2 million cattle were run under conditions which allowed for regular mustering, with the diseases to be eradicated from these cattle by testing and culling of the reactors. The balance of stock consisted of animals which were not able to be regularly mustered, or were not able to be tested without difficulty, and it was intended to destock these cattle. Eradication of tuberculosis from the feral buffalo herd was to be carried out concurrently with the campaign in cattle herds in the Top End. While there had been no opposition to the BTB campaign from Aboriginal communities, active participation by communities was described as having been “patchy”, especially in the north of the Northern Territory. It was noted there may have been a potential conflict where communities relied on buffalo as a source of meat. 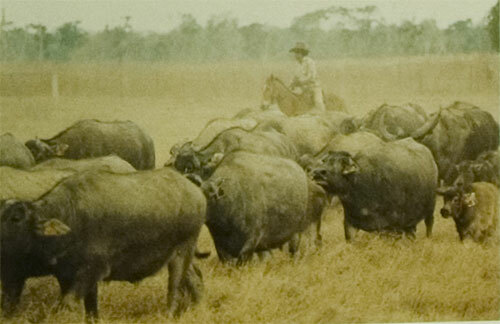 The buffalo industry was expected to support the eradication of tuberculosis from the commercial domesticated buffalo herd, however, that part of the industry which depended on harvesting feral buffalo was expected to oppose the control and elimination of feral buffalo. Northern Territory cattle abattoirs were expected to support the campaign, since the cattle industry would be more stable, producing a regular turnoff, which would be favourable for abattoir throughput and profitability. Abattoirs relying significantly on buffalo would suffer a shortage of slaughter buffalo due to the expected decline in the feral buffalo herd but it was considered that sufficient cattle should be available to replace buffalo at those abattoirs. The Cabinet Submission suggested the plan for eradication of BTB would mean the purely speculative purchase of pastoral leases should become less attractive, due to the requirements of the BTB programme, which should in turn be favourable for the development of the beef pastoral industry. Cabinet approved the plan for eradication of BTB from the Northern Territory and the negotiation of an agreement with the Commonwealth to cover operations and funding of the eradication campaign and to provide assistance measures for cattle producers. Cabinet noted that a policy for the control of feral buffalo, and the eradication of tuberculosis from the feral buffalo herd, must be implemented concurrently with the eradication of tuberculosis in domesticated commercial buffalo, and cattle in the Top End. Read the Cabinet decision - submission number 2257 and decision number 2674 of 1 December 1982 (11.7 mb). When Cabinet approved the brucellosis and tuberculosis eradication campaign for cattle and buffalo in December 1982, it also considered a submission on the long term objective for the role of buffalo in the Territory. The submission noted that buffalo had been present in the Top End of the Territory since 1826 and had remained largely a feral animal resource exploited for hides, meat, live export and tourism. The buffalo was also well known as the NT trade symbol. The buffalo population was 280,000 and generated primary production income of $6 million, in addition to tourism-related income. Secure pastoral leases were first granted in the late 1960s in the Adelaide-Alligator Rivers area where the buffalo industry was based. Conflicts of opinion began to emerge from that time regarding the resource potential of buffalo, their ability when uncontrolled to degrade the environment and their importance both locally and nationally in terms of bovine and ruminant diseases. The development of the Buffalo Policy was informed by a number of reports and a Buffalo Industry Symposium held in February 1981. Issues discussed in the policy's development included the priority to eradicate tuberculosis (TB) from NT buffalo, pastoral production value, the current and future value of the recreational industry involving buffalo, environmental issues, suitability of land systems for buffalo production, and support to pastoral enterprises. encouragement of multi-purpose activities to the maximum degree possible such as pastoral with tourist activities and TB eradication with domestication. Cabinet also asked that the government’s policy of involving Aboriginal people in ventures of this type be encouraged. re-assessment of the system of allocating buffalo tenders. Read the Cabinet decision - submission number 2290 and decision number 2707 of 1 December 1982 (11.7 mb).